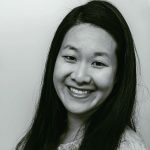 Published Jul 14, 2017 By Julia 5 CommentsThis post may contain affiliate links. It’s super easy to make these breakfast crepes: just two ingredients in this recipe and you don’t need any flour. 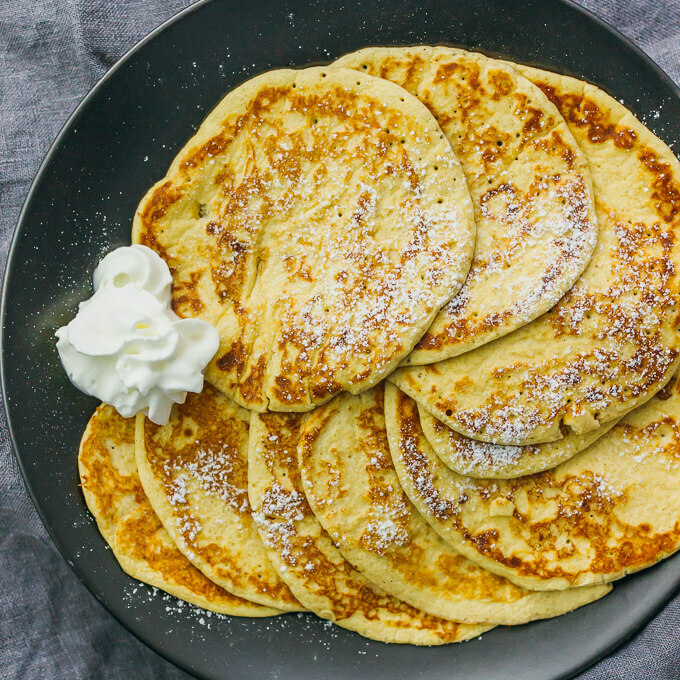 They are a great healthy and low carb alternative to your usual crepes or pancakes. Years ago, Mr. Savory Tooth tried a low-carb Atkins-like diet. He didn’t necessarily find it difficult to restrict himself from carbs; instead, the hard part was finding enough variety in his daily meals so that he wasn’t eating the same thing again and again. For breakfast, it was always eggs and bacon, and maybe some avocado. This quickly became repetitive. 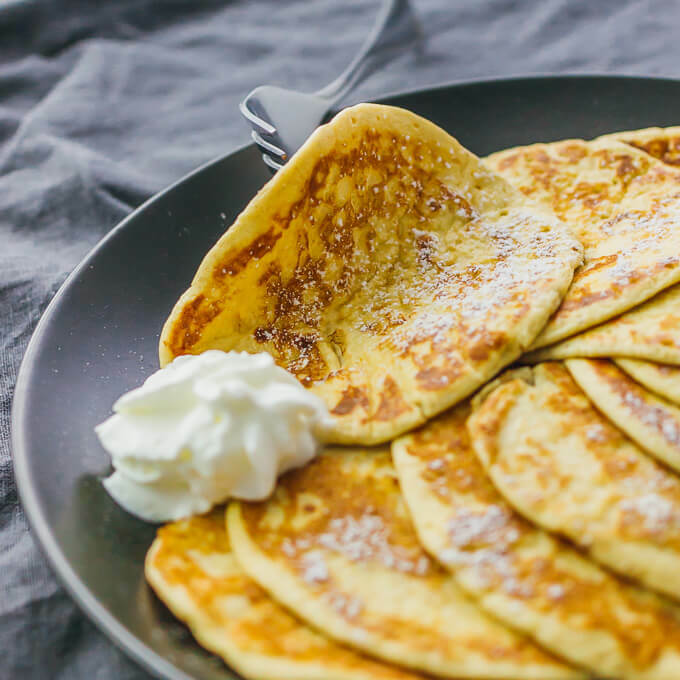 That’s where the idea for these low-carb breakfast crepes come in — you don’t need any flour, just 2 ingredients: cream cheese and eggs. 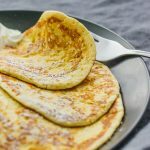 It’s really easy to make them: blend the ingredients together and pour the batter onto a hot pan or griddle like you would any other normal crepe or pancake. 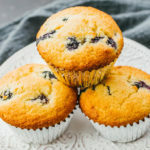 They are delicious, don’t taste very “eggy” at all, and you can top them with almost anything, such as sliced fruit and whipped cream. It’s a great break from the usual eggs-and-bacon breakfast routine. This recipe makes a bunch of small crepes, enough to feed two people. It comes out to 3.3 grams of carbs per person. Not bad for crepes, right? 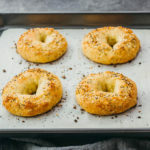 It has few enough carbs such that you can easily incorporate them into your usual rotation of low carb dishes. You can make them more interesting by topping them with healthy options such as sliced avocado, dark chocolate, coconut shavings, Greek yogurt, and various nuts and seeds. If you are worried that these crepes will taste like eggs, I can assure you that they do not. I went through a couple of different batters with varying combinations of cream cheese and eggs, and the resulting batter yields crepes that actually taste like crepes. Especially if you add typical crepe/pancake toppings such as maple syrup, fruit, or jams, you are not going to be able to tell the difference between these crepes and the usual flour crepes. Breakfast crepes using only 2 ingredients -- healthy and low-carb. 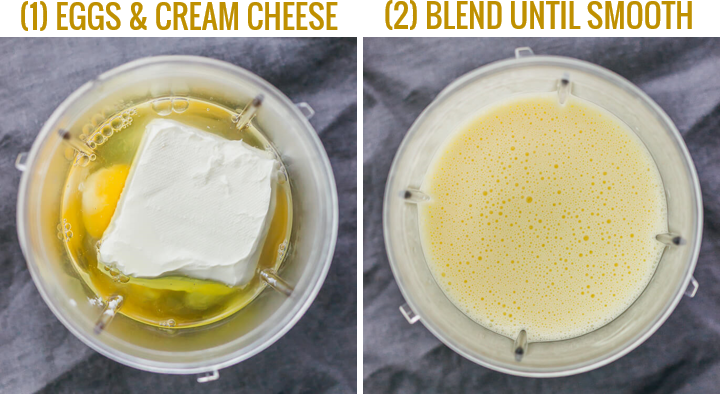 Add cream cheese and eggs to a blender. Blend until smooth. Heat a nonstick pan over medium heat for a few minutes until hot. Add about 2 tablespoons batter to the pan. Cook until the underside is golden, about 2 minutes. Flip the crepe and repeat with the other side, about 1 minute until golden. Transfer to a plate. Repeat until the batter is used up. Optionally, top the crepes with your toppings of choice. 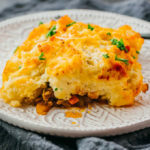 This recipe yields 2 g net carbs per serving. Fantastic! Thanks for the feedback. My daughter made these and they were awesome! Love, love, love!!! 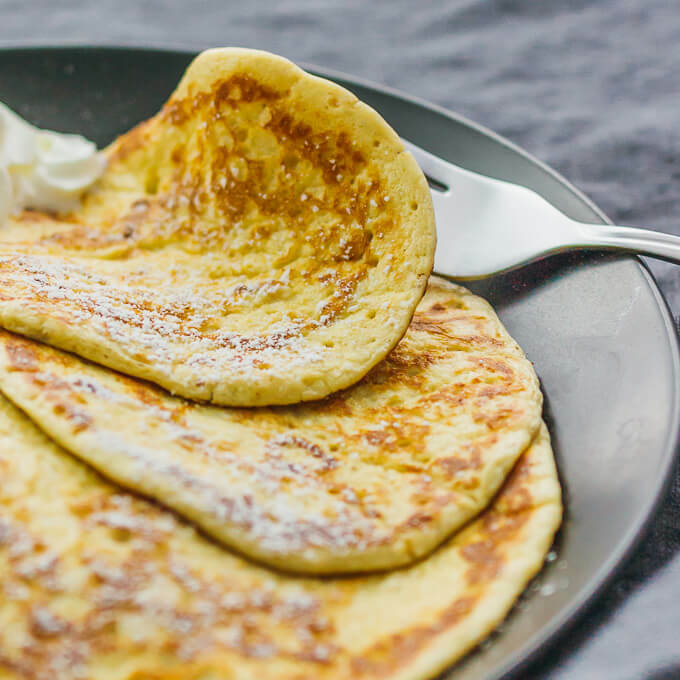 So easy, tasty… the best recipe for lowcarb crepes I’ve ever tried. This was fun to make and so easy!